Sprinkler Solutions, a Rain Bird 100% Select Contractor, an expert in irrigation design and installation for residential and commercial applications. We provide everything from new construction irrigation design and installation for residential and commercial properties, to controller replacements, & head adjustments. We design our irrigation systems with top quality commercial grade Rain Bird Products, with efficiency in mind. We believe in doing the job right the first time. Count on the team at Sprinkler Solutions for a quality irrigation system offering the best value for your hard earned green investment. As a reputable contractor serving Dayton and Cincinnati Ohio for over a decade homeowners and business owners trust Sprinkler Solutions for their complete irrigation system needs. As a Rain Bird 100% Select Contractor, you can expect high quality Rain Bird Professional Series Products for a long lasting, low maintenance irrigation system. Providing lawn sprinkler systems custom designed, efficient for reduced water use, protecting ground investments while maintaining a beautiful green lush landscape. Sprinkler Solutions has an indisputable strong reputation for providing excellent craftsmanship on every job we undertake, and that is why we are known for installing the best irrigation systems in the area. Furthermore, you will have the best system on the block. Our standard irrigation system specifications are extra cost options from others. We install Rain Bird Professional Series Rotors and 1800 Professional Series Pop-up Spray Head Sprinklers, with built in Seal-A-Matic check valves. The importance of incorporating check valves is to prevent low head drainage, eliminate runoff and soil erosion, saving you water every time your systems cycles. 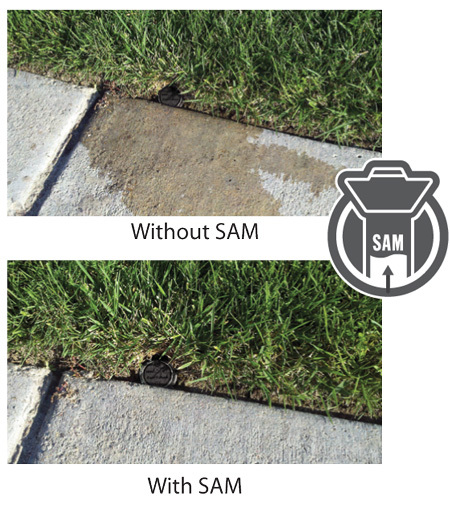 When your system shuts down, water will seek out the lowest sprinkler located on any area of changing elevations, resulting in the slow drainage of water and pooling of wasted water, soon to be a breeding ground for algae on walkway surfaces. In addition, check valves minimize water hammer every time your system starts, smoothing at startup, effectively trapping water in the lateral pipes keeping them full, ultimately reducing wear on sprinkler irrigation components. Furthermore, Rain Bird SAM Series Products contain much stronger stainless steel retraction springs, one of the strongest in the industry, assuring you the sprinkler will retract down time and time again. Sprinkler Solutions installs 6” pop-up spray head sprinklers, 2” higher than industry standards. Whether you cut your grass at 3” or 5” you still get the same great coverage with our systems. You shouldn’t be forced to cut your grass at the height of the sprinkler head coverage. Remember, taller grass is healthier grass, keeping soil cooler, shading out weeds, while encouraging deep roots. Sprinkler Solutions includes a complimentary irrigation system winterization for the first year on all installations. As we support water conservation, we also include the intelligent Rain Bird WR2 Wireless Rain Sensor on all irrigation system installations. The WR2 Rain Sensor will detect rainfall and adjust automatically, sending a signal to the controller shutting your system off avoiding any unnecessary watering from occurring. This is a must have component, saving up to 35% on water usage, while promoting beautiful lush landscapes. Contact the team at Sprinkler Solutions for an irrigation estimate today. We will be pleased to offer you budget friendly solutions, tailored to fit your unique lawn and landscape.